Blair Douglas, senior commercial pilot for one of the planet’s largest international airlines, is passionate about commercial jets and fine boats. What better part of a team to head up a global web property that represents commercial aircraft sales could you want? ...they both enjoy expensive toys. Attending a yacht show, Blair was introduced to the interactive web site WebStager (OneBigBroadcast’s creators) created for Cooper Boating – Canada’s largest yacht charter and Boating School. 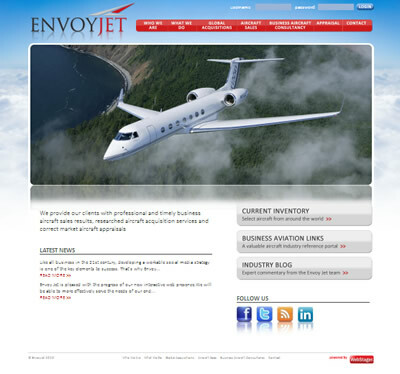 He appreciated what we had to offer and asked us to build an interactive CMS driven web property for Envoy Jet. Blair wanted to dominate the world of social media distribution combined with high search rankings. OneBigBroadcasting’s platform delivered. Our creative team developed a branded look that transcended the realms of traditional commercial jets. We used our CMS, allowing Blair’s team to update content, images and video. From a digital distribution perspective, the Envoy Jet platform is capable of updating 5 simultaneous V Blogs while attracting high engine search positioning. We then connected our Cooper Boating and Envoy Jet families to enable them reciprocal access for mutual benefit. We tapped into two separate databases, one controlled by a booking company tailored for yacht charter and another for private jets to facilitate a seamless experience for the discriminating traveller.